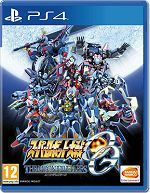 2016 marks the Super Robot Wars series' 25th Anniversary, and it is clear that Bandai Namco are celebrating with the ultimate present for import fans - an English release for the PS4! Make sure you save some of that excitement, because we have even more 25th Anniversary projects to look forward to later on in the year! The strategy battle game where players can put together teams of two robots will now allow players to choose from two story paths as well- one that follows Touya (easier) and the other with Calvina (from Super Robot Wars J). Super Robot Wars OG: The Moon Dwellers has also introduced the option to start in 'Beginner Mode' with a 'Guidance Scenario' system that makes it easier for new players of the series to enjoy the game fully, as more funds and upgrade parts will be made available to them. Please note: A Singapore PlayStation Network (PSN) account is required to redeem/download any downloadable content (DLC) of this game!